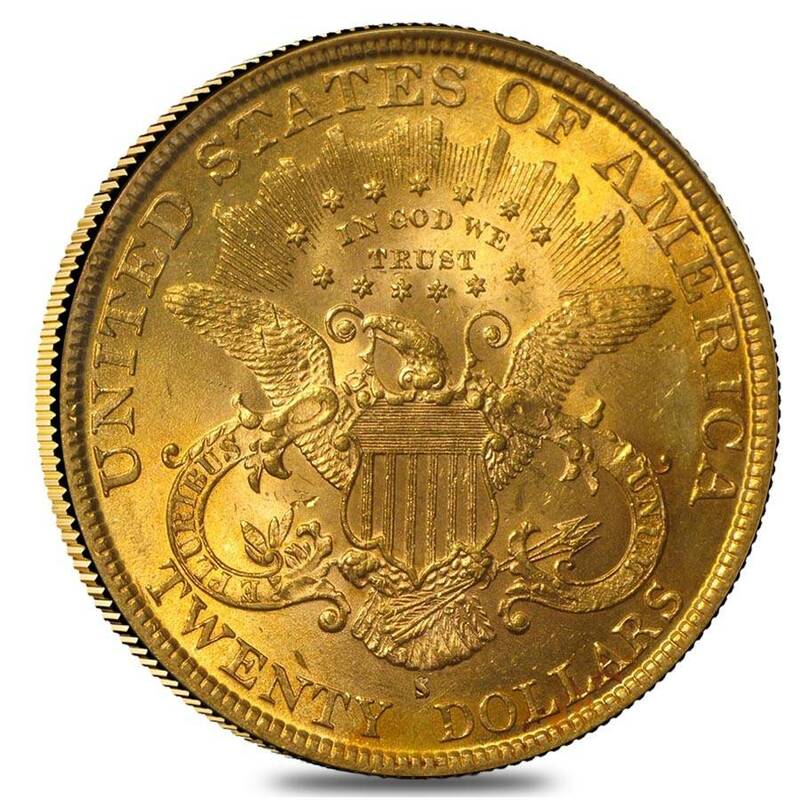 The California Gold Rush of 1849 provided the US Government with an opportunity to come up with a higher denomination, the $20 Gold Double Eagle that would help in bank transactions and made it easier for businessmen and merchants to trade. Until that time, the $10 Eagle was the highest denomination. Due to the crown worn by Lady Liberty on the obverse of the Double Eagle, it is also known as Coronet Head. It was minted from 1850-1907. Contains .9675 troy oz. of .900 pure gold. Obverse: Features leftward facing portrait of Lady Liberty wearing a pearl-studded Coronet with “LIBERTY” inscribed on it. Encircled by 13 stars to represent the 13 original colonies of US. Year of mintage at bottom. A design by James B Longacre. U.S. Mint issue from the following branches: Philadelphia, Denver, Carson City, San Francisco, or New Orleans. Why buy the Gold Liberty Head Double Eagle? This Double Eagle Liberty Head Gold Coin is made of 90% gold and 10% copper which makes it durable to any kind of wear. Comes in Brilliant Uncirculated condition which is preferred by most of the collectors. Due to its bullion content, it provides a fantastic investment value. The coin can be a fabulous heirloom. Its age, rarity, and the beautiful design makes it an attractive numismatic asset. Helps diversify and stabilize the investment portfolio. The $10 Eagle was the highest denomination in the USA until the arrival of the $20 Double Eagle. It was the abundance of gold found in the California Gold Rush of 1849 that led the US government to bring out a new denomination, since trading and bank transactions were inconvenient with the $10 Eagle. This new coin was aptly named the $20 Double Eagle to denote that it was double the amount than the Eagle. The coin was designed by Chief Engraver James B. Longacre and the obverse featured the left facing bust portrait of Lady Liberty wearing a pearl studded coronet on her head which is inscribed with the word “LIBERTY” on it and the device is surrounded by 13 stars which symbolize the 13 original colonies of the USA and at the bottom is the year of mintage. The reverse features a heraldic eagle with a shield on its breast and holding olive branches and arrows in its talons, design inspired from the Great Seal of the United States. The words “IN GOD WE TRUST” are inscribed and the eagle is surrounded by 13 stars above. This is one of the first federal coins to sport the initials of the coin designer. These coins were minted from 1850-1907. Many of these coins were lost when President Franklin Roosevelt’s executive order required the public to surrender all the gold coins and bullions they owned to the US Treasury during the time of the Great Depression. The surrendered gold was all melted to make gold bars. Due to this confiscation a majority of the Double Eagle Gold Liberty Heads were lost and only a few that escaped confiscation survive today making them very rare and aged coins with great historical significance. This means that the demand for these coins is high, particularly those which are in brilliant uncirculated condition. 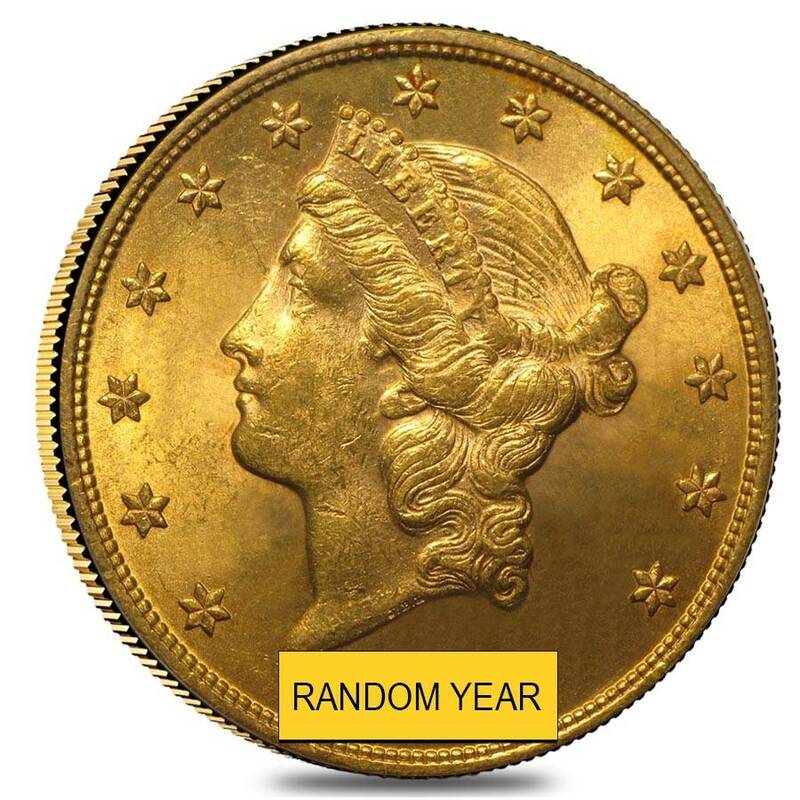 Bullion Exchanges is pleased to offer the $20 Gold Double Eagle Liberty Head - Brilliant Uncirculated BU (Random Year) at one of the most competitive prices in the industry. Browse our collection of Pre-1933 US Gold coins today to become a proud owner of an inseparable part of American coinage history. Contact us at 800-852-6884 if you have any questions in regards to any of our precious metal products. These are very nice coins, fast shipping, always a happy customer .Thank you ! With this purchase, you earn 1300 Bullionaire Bucks 1300 BB = $1.30. For every $1 spend, you will earn 1 Bullionaire Buck which is equivalent to $0.001 off a future purchase. 1300 BB = $1.30.